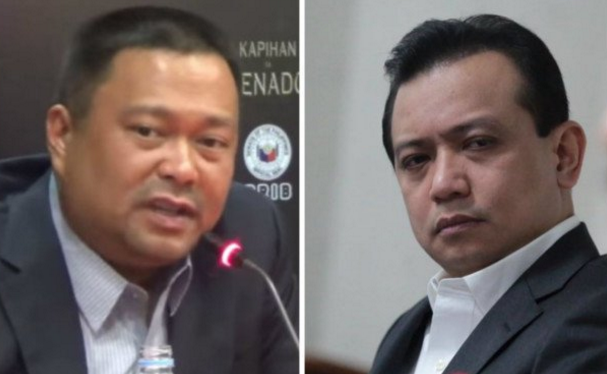 Senator Antonio Trillanes IV may face an ethics complaint for becoming “damaging” to the Senate and “destructive to the country,” Senator Joseph Victor “JV” Ejercito said. He was reacting to Trillanes’ remark at a forum on Monday where he slammed his colleagues for turning the Senate as the “last bastion of democracy” to merely “puppets” of the administration. “’Yung Senado na dating last bastion of demoracy, ngayon wala na. Para na rin kaming mga tuta ng administrasyon na ‘to" he said. “He should be reminded that as a democratic institution, we in the Senate debate issues instead of hurling insults; we vote instead of calling each other names when we disagree,” he said. “We have 23 independent minds duly elected in the Senate. But even when we disagree on a number of issues, we maintain our respect for one another. I hope Senator Trillanes would do the same. I hope he will stop destroying this institution simply because he is rabidly against this administration,” he added. Ejercito said that it was not the first time Trillanes had insulted his colleagues. “It is really difficult to do this against a colleague. Even with Senator (Leila) De Lima, I sympathized. Senators need to respect their colleagues,” he said. Trillanes and De Lima are both part of the Senate minority bloc and have been vocal against President Rodrigo Duterte. “The independent-minded senators resolve their differences through debates rather than hurling insults. Name-calling is disrespectful and unparliamentary,” Ejercito stressed.